TOKYO -- Four Japanese automakers on Thursday said they found no safety issues with aluminum parts supplied by Kobe Steel, allaying some concerns that falsified quality data on products from the steelmaker had compromised their vehicles. Kobe Steel shares surged after the carmakers' statements, but the steelmaker still has to contend with a U.S. Justice Department probe, while checks continue at hundreds of companies involved in complex supply chains spanning the globe. Japan's third-biggest steelmaker admitted earlier this month it falsified specifications on the strength and durability of aluminum, copper and steel products, along with materials for optical disks. The falsifications stretch back for more than 10 years, a senior executive told Reuters this week. Since then, global automakers, aircraft companies and other manufacturers have scrambled to identify potential hazards in their products. Toyota Motor, Honda Motor, Nissan Motor and Mazda Motor have said that hoods and other exterior parts used in their cars which were made from aluminum directly supplied by Kobe Steel were safe. Kobe Steel shares ended the day nearly 7 percent higher but are still down by more than a third since it announced the data falsification. Automakers are still making checks on other parts, including those that they received through their parts suppliers. "We confirmed that the materials satisfy applicable statutory standards, and our own internal standard, for key safety and durability requirements for vehicles," Toyota said in a statement. Toyota, one of the world's largest automakers, identified aluminum plates supplied by Kobe Steel for the hoods and rear hatches of Toyota and Lexus brand vehicles. Though outside the automaker's specifications, they were still safe to use. While Subaru and other carmakers said they were still investigating the issue, the announcements by Toyota, Honda, Nissan and Mazda suggest that Kobe Steel's cheating scandal may have a limited impact on product safety. Nonetheless, the company's fate hangs in the balance while checks are being carried out. It must report to Japan's industry ministry by around the end of next week on any safety concerns and provide a more extensive account of the problems a fortnight later. Industry leaders have reached a consensus that Kobe Steel is in a "serious situation," a senior Japanese manufacturing executive told Reuters. "For a manufacturer, quality control is the most important thing and they were cheating for many years. This was a shock to their customers, who can no longer trust Kobe Steel," the executive, speaking on condition of anonymity, said. This was the view of Japanese industry leaders, even though no safety issues have so far been identified, the executive said. Kobe Steel customers will seek compensation for the cost of replacements and checks but "I do not think they are leaning toward lawsuits," he said, adding that as far as he had heard there will be no recalls. Overseas customers, especially those in the United States, present more of a threat though, in light of the Justice Department investigation. "I would think there will demands for quite a bit of compensation (from U.S. companies)," he said. In Europe, aviation safety authorities earlier this week issued a directive advising aircraft manufacturers to avoid using Kobe Steel products if they can until checks are completed. There was no manual providing guidance to staff on cheating product specifications, a senior Kobe Steel executive told reporters, on condition of anonymity. Japanese media reported that staff used such a document, but the executive said he did not know whether memos were passed around among staff. Some of the data tampering was an abuse of an industry practice known as "tokusai," a kind of special waiver, that is agreed between buyer and supplier, the executive said. Buyers will accept products or materials that do not quite meet agreed specifications, the executive explained. The problems occurred where products were falsely labelled or where the specifications were outside those agreed with the customer but labelled as within specifications, he said. Board members of Kobe Steel were "absolutely not aware" of an abuse of tokusai, he said. 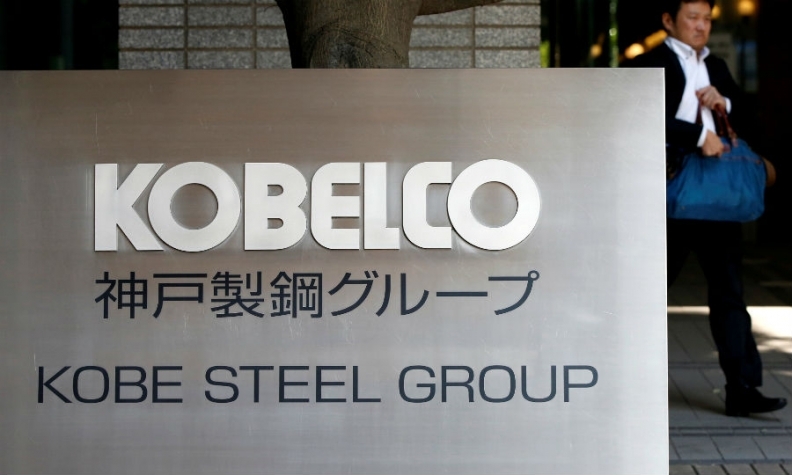 Two certification companies confirmed that they are investigating whether Kobe Steel was in line with ISO9001, a global standard on overall quality control. Lloyd's Register Quality Assurance and Japan Quality Assurance Organization said they may suspend or cancel ISO9001 certification of Kobe Steel's plants or subsidiary, if they do not meet the standard. They would not confirm a NHK report that they plan a site inspection as early as later this week. If the certification is cancelled, it could affect the company's business as many global buyers require suppliers to have ISO9001 to do deals, Jun Yasumoto, technical manager at Lloyd's Register in Japan, told Reuters. Japan's Ministry of Land, Infrastructure, Transport and Tourism plans to probe the safety of automobiles, trains and planes using Kobe Steel products, a ministry spokesman said on Thursday. The meeting will share information but its final scope and start date have not been finalized. It is too early to talk about industry consolidation involving Kobe Steel as the impact of the data fabrication is still being investigated, a former top executive at Japan's Nippon Steel and Sumitomo Metal said on Thursday.